Lithograph by well-known Indian artist Parker Boyiddle created in 1980 for the 300th anniversary of the Great Pueblo Revolt. My copy hangs over my desk, wherever I live. Today’s Pagans, particularly those who inspired by an ancient polytheistic tradition, often wonder why their Pagan ancestors gave up their beliefs. It’s a complicated story. Some, like the Saxons conquered by Charlemagne, were in a convert-or-die situation, and thousands died. Sometimes, as in the Roman West, you get the feeling that the upper classes, at least, just followed a fashion set by the emperor: “If you’re going to get ahead, it helps to be a Christian.” The lower classes were slowly brought around by a mixture of preaching, examples, and punishments. The Nigerian writer Chinua Achebe, whose best-known work, Things Fall Apart, is set in a late-19th-century Igbo community, describes government-backed missionaries’ influence on the community, and some of the people’s response (or rather, non-response) might surprise you. In one instance, however, indigenous people fought a war against the missionaries and won. It was Pagans 1, Catholics 0, at least until the rematch. To summarize a lot of history: During the 16th century, several Spanish expeditions crossed or probed the upper Rio Grande Valley of what is now New Mexico, as well as entering settlements to the west, such as Zuni (New Mexico) and the Hopi towns (Arizona). Serious colonization began in 1598 under the leadership of Don Juan de Oñate. About fifty Franciscan monks and priests were part of his expedition, bringing not just their gospel but Mexican chiles, tomatoes, and melons, as well as Eurasian peach tree seedlings and more, thus changing foodways of the American Southwest forever. More colonists, soldiers, and missionaries continued to arrive subsequently, although never in large numbers. The Franciscans not only wanted to replace the idolatrous religious practice of the Pueblos, which were clearly the work of the omnipresent Devil, but also all aspects of their non-European, barbarian way of life The Indians needed to learn to wear proper clothes and shoes, to be modest, and to never engage in adultery.1)Jake Page, Uprising: The Pueblo Indians and the First American War for Religious Freedom (Tucson: Rio Nuevo, 2013), 57. Over the next eighty years there were sporadic acts of resistance but nothing major. The leaders of rebellions were usually questioned, tortured, and executed. In one 1675 round-up of rebels, 47 religious leaders (medicine men) from nearby Pueblo towns were brought to Santa Fe, where a few were hanged and the rest flogged and imprisoned. One man, a shaman named Po’pay (also spelt Popé), from San Juan Pueblo (now using its old name of Okeh Owingeh again), upon his release announced to the people back home that the gods had given him a plan. He and his group carried out an astonishing strategy: they organized warriors who spoke multiple languages (all unwritten), over distances of hundreds of miles, to all rise up on the same day, 11 August 1680. Inevitably, there were some security leaks — the Spanish governor in Santa Fe found out what was planned, and so Po’pay told people in his area to strike a day early. The priests died first. Churches — even huge adobe edifices like the first church at Pecos — were burned internally and then torn down brick by brick. Other warriors attacked Spanish farms and ranches, killing and looting. In the north, survivors fled to the governor’s palace, the casas reales, in Santa Fe, while others further south gathered at Isleta, south of today’s Albuquerque. Twenty-one Franciscan friars “achieved martyrdom” that first day. At Hopi, after they torched the churches, “the two-hundred-pound bells, so piously hauled the thousand miles from New Spain [Mexico] over the years, were destroyed, except at Oraibi where they were hidden, and remain so to this day.”2)Ibid., 115. The survivors, less than half of the colonial population, prepared to break out of their siege in Santa Fe, even though most were not fighting men. But the Indians, who outnumbered them, let them go, and they straggled south, eventually stopping where Ciudad Juárez, Mexico, now stands. Catalina de Zamora passed muster with four grown nieces, Spaniards, all on foot and extremely poor, and five servants [presumably Indians]. The enemy killed two of her nephews and more than thirty relatives. She does not sign because of not knowing how.3)Ibid. 136. When you read that the natives of western North America “got horses from the Spanish,” 1680 is when that happened. No Golden Age emerged in the former colony. Some communities mounted a “de-Hispanization” campaign. At Okeh Owingeh, Po’pay ordered un-baptism ceremonies and forbade his people to ever mention Jesus, Mary, or other saints again. Other communities relocated to more defensible locations, expecting that the Spanish would return — which they did, twelve years later, in 1692. Meanwhile, inter-tribal wars flared up again, Apache raids were a constant problem, and drought was always lurking. The Reconquista is sometimes described as “bloodless,” but it was not. Many Pueblo towns looked at their odds and decided to surrender. Without the grand coalition of 1680, the 50 veteran Spanish soldiers who accompanied the new (or returning) colonists could defeat the warriors of any single town. Yet in some places, there were bitter fights. Archaeologists found evidence of them only relatively recently — David Roberts’ The Pueblo Revolt (linked at the image) tells that story. Jake Page’s Uprising: The Pueblo Indians and the First American War for Religious Freedom, which I have quoted here, is stronger on the cultural background issues and the long-term effects of the Great Pueblo Revolt and the Reconquest. I would recommend it as a good first book on the revolt. 1. ↑ Jake Page, Uprising: The Pueblo Indians and the First American War for Religious Freedom (Tucson: Rio Nuevo, 2013), 57. Shulawitsi, the Little Fire God, member of the Council of the Gods and Deputy to the Sun, had taped his track shoes to his feet. He had wound the tape as Coach had taught him, tight over the arch of the foot. And now the spikes biting into the packed earth of the sheep trail seemed a part of him. (1973) by Tony Hillerman, one of a series of more-than-mysteries set in and around the Navajo reservation in Arizona and New Mexico, and all still in print. The Sun Dagger at Chaco Canyon — an Ancestral Puebloan (Anasazi) residential/ritual/governmental (?) complex in northeastern New Mexco that flourished during what where the early Middle Ages in Europe — is well-known among archaeoastronomers, as is the possible solar alignment built into one of the grand kivas nearby at Casa Rinconada. Now another solar “clock” is being claimed at the the ancient Puebloan site preserved at Wupatki National Monument in northern Arizona, where moving shadows and petroglyphs mark the solstices and equinoxes: an “imaging calendar,” as it is called. “The historical accuracy of the alignment may be less important than its symbolic value, especially for those who flock to the site on the summer solstice. So perhaps we look at all astronomical alignments in whatever country as wonderful examples of nature religion. Casa Rinconada attracted a crowd during the Harmonic Convergence of 1987, when various New Age thinkers, led by José Argüelles, promoted prophecies connected to a planetary alignment: “The convergence is purported to have ‘corresponded with a great shift in the earth’s energy from warlike to peaceful. '”1)No doubt you have noticed how much more peaceful the world is. My view on astronomical alignments was being warped in the 1980s by seminars with Davíd Carrasco, a scholar of Mesoamerican religion who has spent a lot of time working with temple alignments and associated mythology. My take-away was that astronomical alignments are mostly about priestcraft and power. Farmers don’t need rows of giant stones to tell them when to plant. Every locale has its indicators: here in the southern Colorado foothills, when the emerging leaves of Gambel oak are thumbnail-size,2)“As big as a mouse’s ear,” some people like to say, because it sounds more folkloric. the chance of a frost is usually past. (Usually!) And I know that the sun sets in a notch on the ridge to the west at the equinoxes, for what that is worth. Being able to proclaim the cycles from the temple steps is probably more about showing how “King Jaguar” enjoys of the favor of the gods than anything else. 1. ↑ No doubt you have noticed how much more peaceful the world is. 2. ↑ “As big as a mouse’s ear,” some people like to say, because it sounds more folkloric. 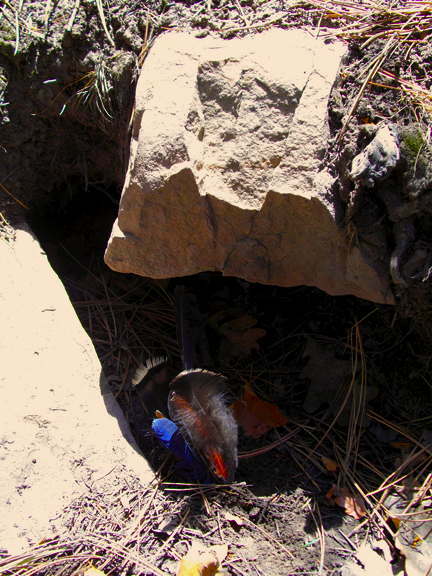 Bundle of turkey, Steller’s jay, and flicker feathers placed in a dry spring basin. On Friday morning, April 29, back from a early morning fire call (shed + trash + grasses at the edge of the prairie), I climbed the ridge behind the house and made an offering to Tlaloc, the god of rain. Later that day the Sand Gulch Fire exploded, forcing us to evacuate our house and spend the night in our pop-up camping trailer parked next to the fire station. But the next day it snowed four inches, helping to bring the fire under control. The desert ecologist and nature writer Craig Childs got me thinking about Tlaloc a while ago with some evocative passages in his book House of Rain, which I reviewed on the other blog here (also referenced in this post). At high, prominent springs or caves in Guatemala or the Yucatán, one is likely to find the head of a decapitated rooster (replacing the turkey, which was commonly used in the past) along with pools of melted wax from votive candles (365). This post kicks off my discussion about being an American Eclectic Witch reviving the cult of Tlaloc on a household basis—no stepped pyramids here, just real mountains. 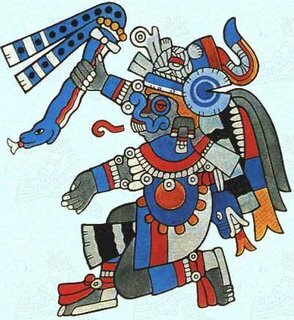 Both Aztec depictions of Tlaloc and Mayan depictions of the equivalent deity, Chaac (if you follow a sort of interpretatio azteca), leave me cold aesthetically, for all that they are richly symbolic. But one thing at a time—perhaps I can find one done in the style of pop-Mexican calendar art. The worship of the gods can change over time—consider this “feast of St. Tlaloc.” We could do that! An only slightly snarky article (it is the New York Times, after all) reports on a decline in “spiritual tourism” in Sedona, Arizona..
Local New Agers seem divided as to whether the economy or the James Arthur Ray sweat lodge deaths are more to blame. But they happened in oversold Sedona, which has been touristy for much of its existence. My mother and stepfather moved there in the 1970s. She was teaching at Northern Arizona University, but he had retired and claimed that he could not handle the altitude of Flagstaff (though he was from Colorado), so they lived in Sedona as a compromise. At that time, Sedona was mostly about art galleries and giving kitschy names to the big rock formations. There was one called Snoopy (after the Peanuts comic strip dog), no less. Young idealist that I was, I found it disgusting. As a newly come-home Pagan, I was not impressed by the desert chapel either when they hauled me out to look at it. I had not yet developed the ability to appreciate the touristy stuff in a hip and ironic way! So between that and some family matters that I will skip over, I was unimpressed by Sedona. When the talk about earth vortices and spiritual power points began, all that I could think of was a rock called Snoopy. Last October 9 I blogged on the deaths at a sweat-lodge ceremony conducted by James Arthur Ray near Sedona, Ariz. There has been a lot of discussion in the Pagan blogosphere about the case, particularly at The Wild Hunt. Actually, throughout much of the world (and throughout history), ceremonies are indeed for sale. How else do you pay for maintenance of the temple? Do you think the Shinto priest is going to bless your new Toyota for free? In Wicca, Gerald Gardner’s insistence on not taking money “for the art” was mostly about avoiding prosecution under anti-fortune-telling laws, not cultural appropriation. But back to James Arthur Ray. The sweat followed a 36-hour period of “visionary” fasting, meaning that participants were more dehydrated than they would normally have been. Ray was a “spiritual jock” (my term, not White’s), pushing people to “push past your self-imposed and conditional borders” and shaming participants into not leaving when they were suffering. The plastic tarp coverings may have trapped heat and retarded air circulation more than fiber blankets would have done, making the lodge even hotter. But he makes several other points as well. First of all, it appears that the lodge was built by the Angel Valley Retreat Center, not by Ray’s team, and had been used previously by other center visitors. Since participants signed a release, it may be difficult to prove criminal negligence in court. I titled my first post “Can You Sue Your Shaman?” But should you? Shouldn’t people walking dangerous paths accept some responsibility? After all, we followers of magical religions insist that we are not sheep who need a shepherd (Latin: pastor). The secular law, after all, has fairly narrow definitions of what constitutes a crime and what constitutes a tort. “Bad spiritual teaching” or “improper ritual” or “malicious magic” do not quality. After all, there was a day—a mere 400-500 years ago—when “malicious magic” or sorcery was a criminal offense in Western secular courts, but do we want to go back to those standards of proof?